Manish Malhotra’s New Bridal Collection at ICW 2017 - We Love Alia’s Outfit! Manish Malhotra’s latest collection closed India Couture Week on 30th July - and this new collection is what every 2017 bride needs! The collection, titled ‘The Sensual Affair’ comprised of lehengas and gowns for women paired with rich sherwanis for men. It was all about metallic sparkles, silver shimmer and rich, deep hues of maroon and midnight blue. It was a blend of Indian and western details. The silhouettes were voluminous and flowy, with billowing skirts, long capes, fringed blouses and sleeves with an air of western regality. An interesting point to note was the corset-styled blouses that a lot of the ensembles featured - an interesting twist to Indian lehengas! In addition to this, the blouses also featured off-shoulder details, long cape sleeves and plunge necklines. The menswear sherwanis were in deep hues of black, maroon and midnight blue with highlighted embroidery worn over white kurtas. This effectively complemented the primarily silver womenswear. Alia Bhatt looked super-stunning as the show-stopper in her princess-worthy outfit of sparkling crystals, a 3D-rose-embellished hem and a long, long train. The peplum-style blouse with a plunged neckline added to it’s glamour. 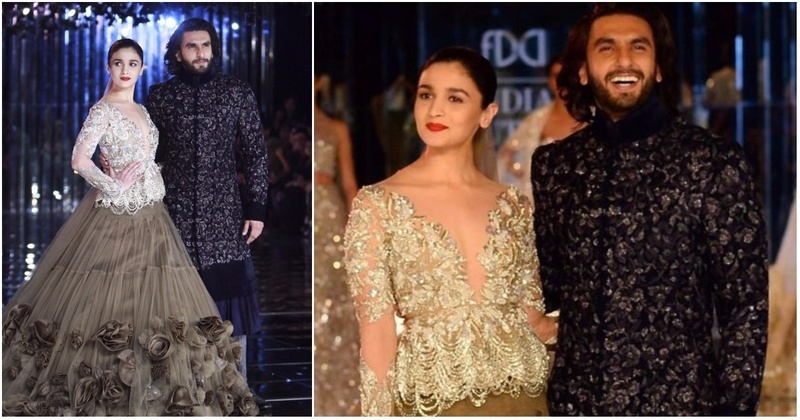 Ranveer Singh accompanied her on the ramp wearing a midnight blue sherwani with elaborate floral threadwork.